The European Bank for Reconstruction and Development (EBRD) finances development projects and is the single largest investor in Central Europe and Central Asia. The EBRD invests mainly in the private sector, but often with public partnerships. Mission: To develop open and sustainable market economies in countries committed to, and applying, democratic principles. Please see the EBRD’s homepage for more information and for specifics on EBRD projects. Problem Solving – this function of the PCM is designed to create dialogue between the parties using methods of fact-finding, mediation, conciliation, dialogue facilitation, investigation, or reporting. Compliance Review– this function of the PCM reviews complaints to determine whether the EBRD has complied with its own environmental, social, and information disclosure policies. Your livelihood may be impacted by an EBRD project (for requests for Problem Solving). For a compliance review, any person or organization may submit a complaint. In both cases, you must have information that a project supported by the EBRD has caused, or is likely to cause, harm. The PCM determines eligibility and proceeds with problem solving, a compliance review, or both. The PCM issues public reports of findings, EBRD management responds, then the PCM monitors and publicly reports on any approved actions to correct noncompliance until there is compliance. For more information, see the Accountability Resource Guide or visit the PCM’s website. Continuing from the 2013-2014 review of the Project Complaint Mechanism’s (PCM) Rules of Procedure, Accountability Counsel has advocated for structural and procedural improvements to the PCM’s operations. 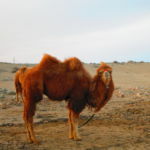 Our Global Communities and Policy teams have coordinated closely to integrate lessons learned from our case experience in Mongolia into our policy advocacy in order to strengthen the PCM’s effectiveness and independence. The PCM currently sits under the Office of the Chief Compliance Officer (OCCO) and Risk Department, making it one of the few independent accountability mechanisms that does not have a direct line of communication to its president or board of directors. Moreover, the PCM officer does not sit at the senior management level within the EBRD. This placement of the PCM within the institution has implications for the both the PCM’s perceived and actual independence and the weight with which the EBRD treats accountability issues. The PCM uses a roster of independent experts in various functions at the mechanism, including conducting compliance reviews of projects. The PCM’s use of a roster of experts, while potentially contributing to the independence of the mechanism, often leads to inconsistency across the experts in their approaches to evidentiary standards, site visits, and other compliance review procedures. The PCM currently lacks a stakeholder advisory group, which undermines its transparency and legitimacy. Such a group can provide expertise and advice on best practice to the PCM, allowing it to continually improve its operations. Restructuring the PCM would address these and other gaps and ensure that the PCM is able to effectively address complaints concerning harms caused by EBRD investments. Accountability Counsel and our partners have been engaging in advocacy concerning the current challenges that the PCM faces in delivering meaningful remedy. The creation of PCM guidelines for handling complaints in order to improve internal consistency, particularly among its compliance reviews. In its response to the letter, the EBRD established that the PCM Officer would, from now on, provide a quarterly report directly to the audit committee as a part of OCCO’s report. In March 2017, we followed up on our earlier advocacy with a letter to the EBRD president and board highlighting issues in recent EBRD complaints, including our Mongolia case. The letter reiterated several recommendations for the PCM, including the development and adoption by the PCM of its own guidelines for handling complaints in order to improve internal consistency and ensure conformance with best practices for independent accountability mechanisms. In response, the EBRD has committed to raising consistency issues in future trainings with PCM experts and staff. 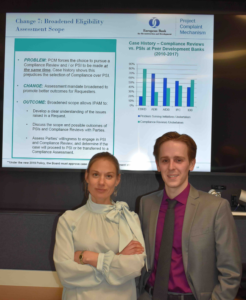 Accountability Counsel’s Policy Director, Kindra Mohr, attended the EBRD Annual Meeting and Business Forum in 2017 (Cyprus) and in 2018 (Jordan) to further advocate for PCM reforms. She and our partners met with bank leadership to raise these issues and work to ensure that the PCM delivers real remedy to affected individuals and communities. The EBRD officially commenced the review of its three major governance policies, including the PCM Rules of Procedure, in February 2018. This review, which also includes the EBRD’s Environmental and Social Policy and Public Information Policy, began with the first of two phases of public consultations. During the first phase of consultations, occurring from 12 February, 2018 to 10 April, 2018, the EBRD accepted written feedback on the current policies. Our joint submission of comments on the current PCM Rules of Procedure and the functioning of the mechanism can be found here. In January 2019, the EBRD published its draft Project Accountability Policy, which would replace the PCM with a new mechanism, the Independent Project Accountability Mechanism. The draft reflects many of our recommendations, especially those on structure and governance, though a number of issues remain. The release of the draft policy marked the beginning of the second phase of public consultations. In London in March 2019, Accountability Counsel and its partners advocated for additional improvements to the draft Project Accountability Policy at an in-person consultation and a roundtable discussion between civil society and the board. Shortly thereafter, Accountability Counsel and 24 CSOs submitted joint comments and recommendations on the draft policy. The final version of the Project Accountability Policy will be released shortly. Accountability Counsel will continue our advocacy to ensure that the successor to the PCM is fully equipped to effectively address harm stemming from EBRD investments. Apr 2018 – Accountability Counsel submitted joint comments to EBRD on its current PCM Rules of Procedure and the functioning of the mechanism. Mar 2017 – Accountability Counsel, and our partners, sent a follow up joint letter to EBRD President and Board of Directors highlighting issues in recent EBRD complaints, including Accountability Counsel’s Mongolia case. Jan 2017 – Accountability Counsel, and our partners SOMO, OT Watch, and CEE Bankwatch Network, sent a joint letter to the EBRD President and Board of Directors highlighting issues at the PCM and providing recommendations. Accountability Counsel has supported Mongolian herders’ complaint to the Projects Complaint Mechanism, the accountability office for the European Bank for Reconstruction and Development, raising concerns about the OT project’s impacts on local water resources and the impact of a diverted river. 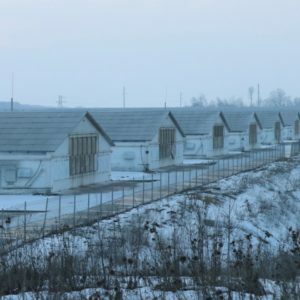 Accountability Counsel has supported a complaint to the Projects Complaint Mechanism about “Europe’s largest poultry farm,” operated by MHP in central Ukraine. The complaint criticizes the lack of transparency and surrounding environmental and health risks posed by the farm.